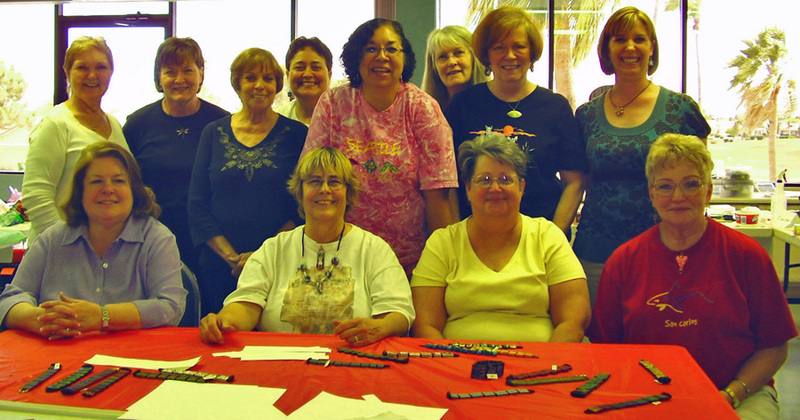 On May 1 & 2, 2010, I traveled to Arizona to teach a weekend workshop to the Phoenix Polymer Clay Guild. 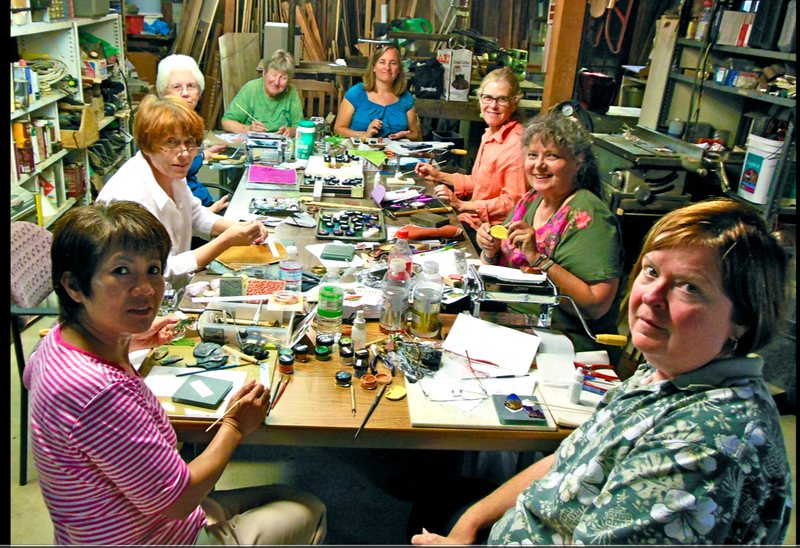 Saturday’s class was “faux porcelain beads“. On Sunday, we made “reversible bracelets“. 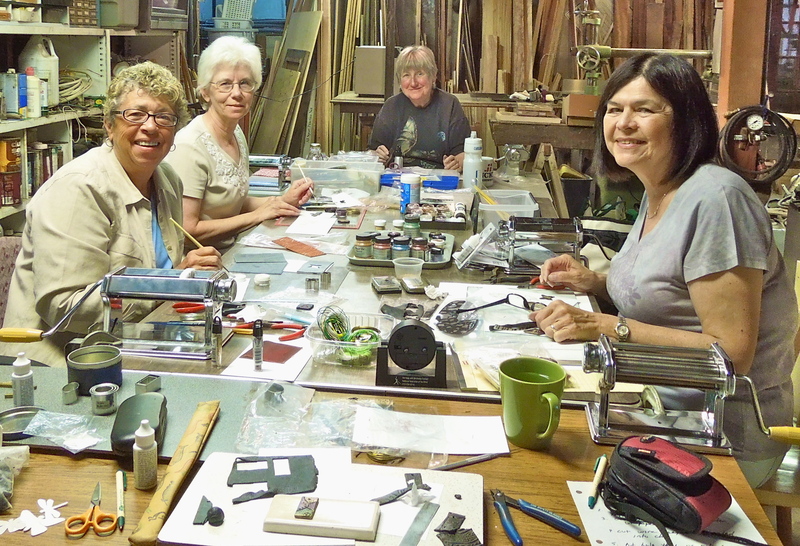 Here is a photo of the people in the bracelet class and the reversible bracelets that they completed. 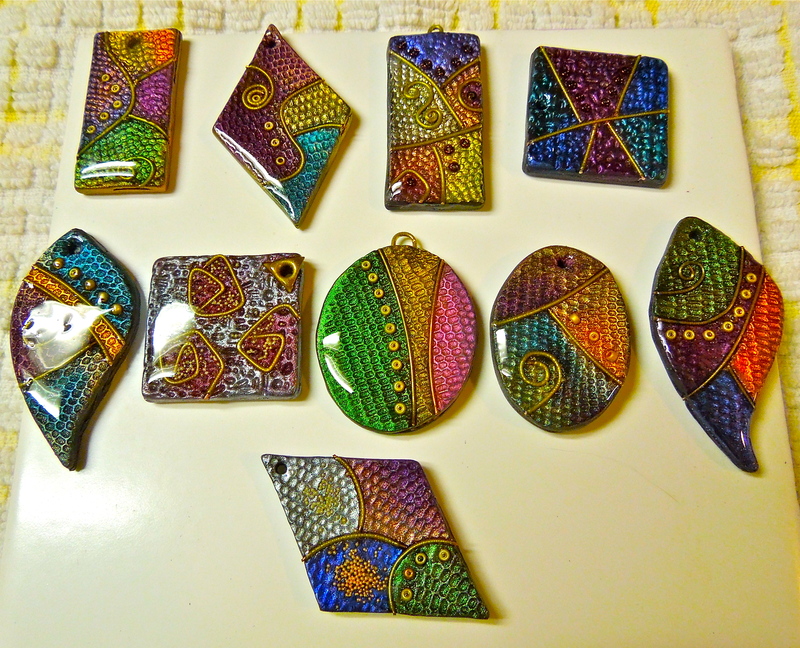 Here is a photo showing the pendants students made in class. 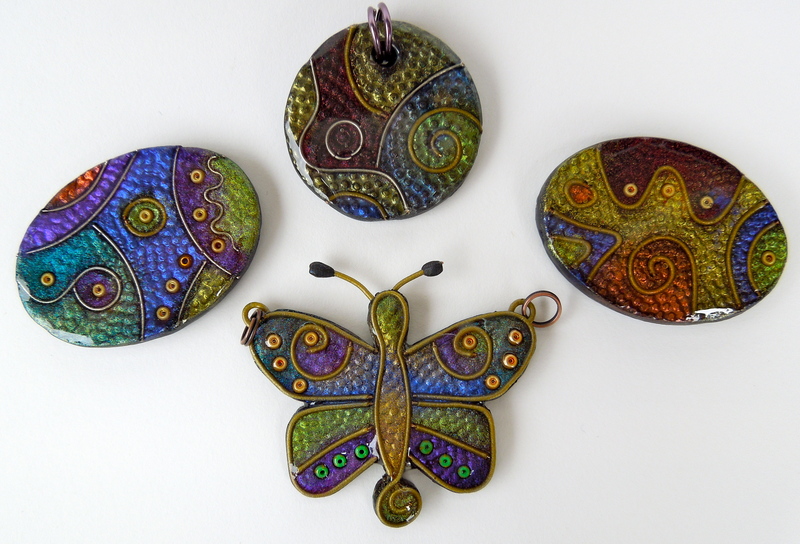 Deborah Anderson teaches a variety of polymer clay techniques to all skill levels. 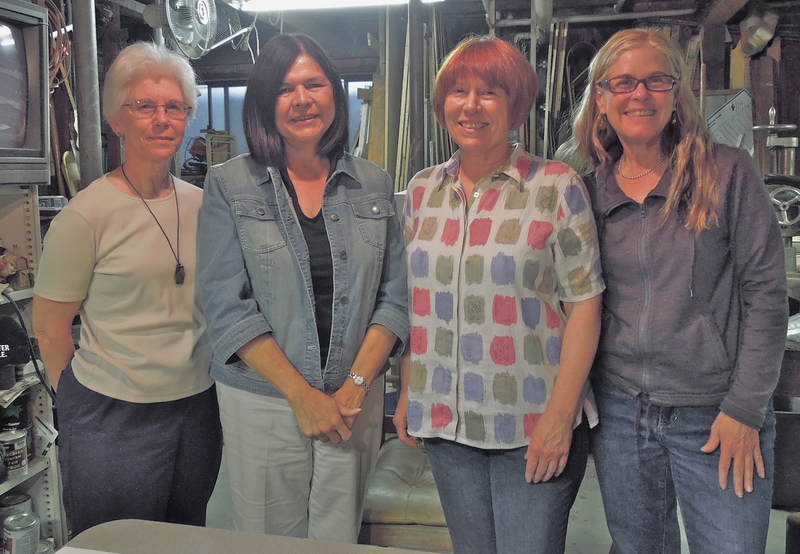 Classes take place once a month in her basement studio. See current schedule for other locations. 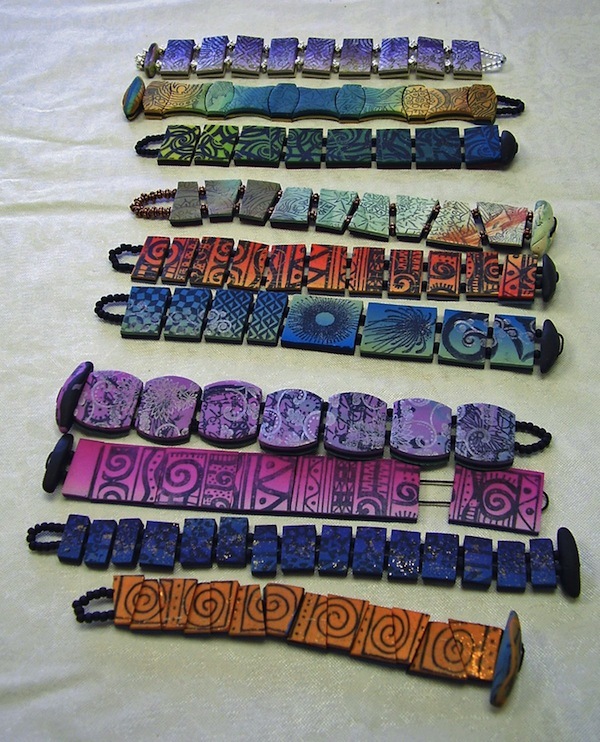 Students will create a fun and colorful bracelet made entirely of polymer clay with different designs on each side, so that it can be worn either way. First, we will be applying a surface treatment onto clay sheets, using decorating chalks, inks and rubber stamps. Then we will use the patterned sheets to construct the clay tiles for the bracelet. You will also learn how to create a cord channel in which the elastic cord will fit through and make a toggle fastener. Lastly, you will be shown how to string the tiles together to complete the bracelet. See Deborah’s article: Reversible Bracelets in Expression Magazine, May/June 2003 issue, page 92-93. 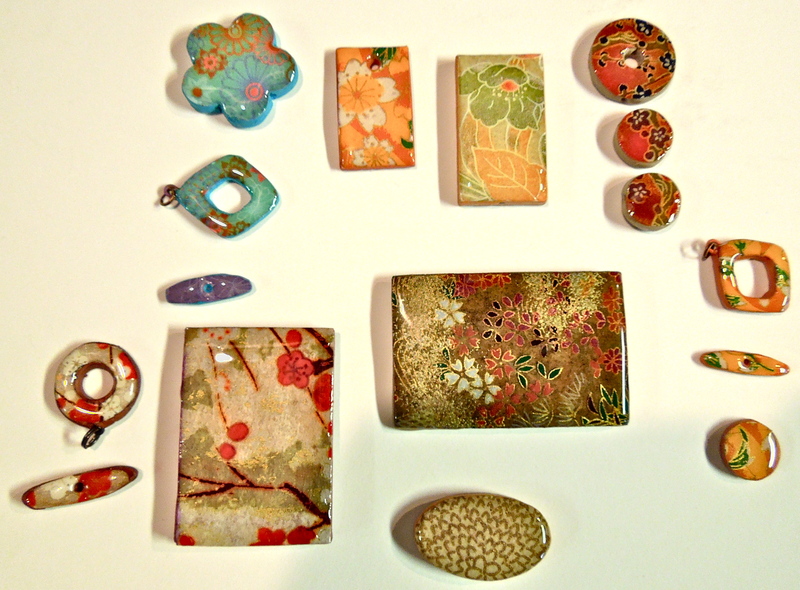 Learn how to create beautiful and unique focal beads that have the look and feel of porcelain, using polymer clay. In this hands-on workshop, students will learn a step-by-step process for constructing dome and cylindrical-shaped hollow beads. The process requires only one baking for curing and no adhesive is used. 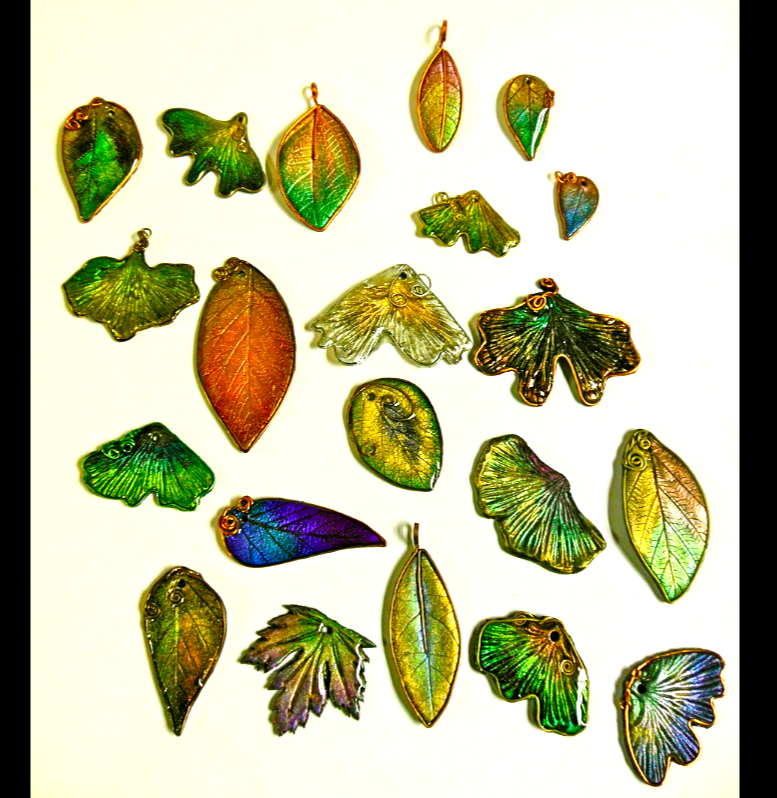 Techniques will include: applying images onto clay, hollow bead construction, applying a very thin layer of translucent clay over the image, making other bead shapes, and more as time allows. The finishing process of wet sanding and polishing the completed beads will also be covered. 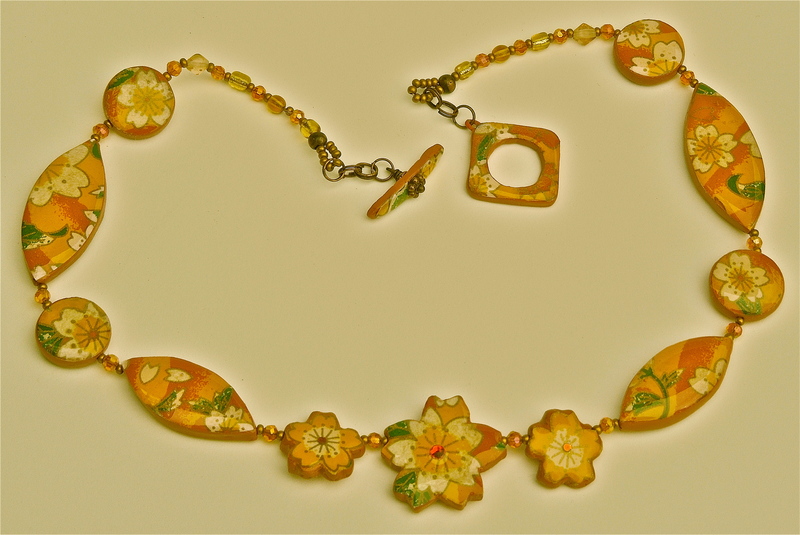 Deborah has an article on “Faux Porcelain Beads in “Bead and Button” magazine, October 2002 issue. Using your favorite rubber stamps, design and create your own unique whimsical “art” pin using polymer clay. 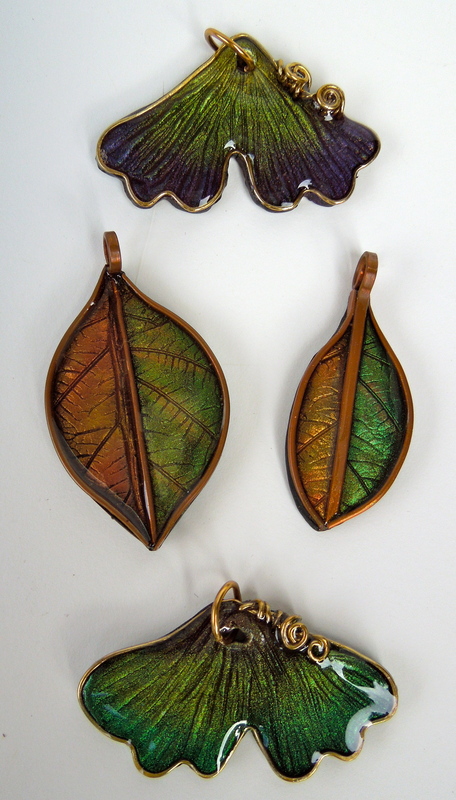 Students will learn how to make their own word tiles and incorporate beads and wire to complete a piece of wearable art. Techniques will include: imagery application, design focus, step-by-step construction, finishing details, and more. In this class, we will use color copies from an inkjet printer and learn how to transfer these images onto very thin sheets of translucent clay, which I call decals. We will back the decal with clay, frame the piece and make it into a tile for a focal bead or use as a brooch or pendant. A variety of surface treatments will be shown for use in framing the piece. Sanding and polishing our cured pieces will also be covered.